Welcome to PART 2 of the Inflammatory Bowel Disease series, where we talk to people from all walks of life with this condition; to give everyone a platform to share their story, and help to raise awareness. First of all, I'd love to thank everyone who shared and read last weeks post - it went very well, and thank you to Alice for being the first to take part! This week we talk to Mark, and his battle with Ulcerative Colitis. Mark apologises for no photograph but wishes to remain anonymous due to being ex-police. Thank you very much for sharing your story for us and helping to raise awareness! I am the Head of Information Security for a large 3rd sector organisation. In addition to this I also volunteered as a special constable for 9 ½ years. Being a cop with Ulcerative Colitis was an interesting experience, but that story is for another day. I was 9 when diagnosed. Before I was diagnosed, I was off school a lot, I had lots of diarrhoea and a loss of appetite. I lost about 2 stone. I was so anaemic (loss of blood during every bowel movement – circa 20 a day) I collapsed and ended up in hospital. The Dr’s didn't know what was wrong with me. Was it appendicitis? Was it an infection? I spent time in isolation as they didn't know if I was infectious. I had to have a blood transfusion and a colonoscopy, which was done under a general anaesthetic; as the hospital only had an adult colonoscopy unit at the time. I was scared. Really scared! I was just a child and didn’t really understand what was happening to me. I could see my parents were worried. At the time, it was very rare for a child to suffer from any form of IBD. My local hospital tried their best, but the paediatric consultants had never treated a child with IBD, in any form. I was sent to specialists in central London. Over the years I have been on and off steroids. The only medication that has remained consistent has been Sulfasalazine. I'm also now on Azathioprine, and have been for some years. Throughout my childhood I had very good treatment from specialists in different hospitals. However, in my adult years following a fairly negative treatment by my consultant (following a bowel cancer scare) I transferred to a private consultant; who luckily now sees me on the NHS. He is excellent, and a world renowned expert in his area – colorectal surgery. I do not have an IBD nurse. I am now on my 10th colonoscopy, and to be honest I could write reams on that subject alone! For me, I do have certain foods that present symptoms; red meat, bread, carbonated drinks. But more often anxiety is what triggers a flare for me. Not that I am personally aware of. Duvet day, it is amazing what staying in bed can achieve. Drink lots of water and eat only plain basmati rice. If it's really bad then I'll use Coalifoam Enemas (steroid). What do you do to give yourself a break, or relax? Listen to house music – I can just completely zone out. Reminds me of wonderful years spent in clubs around the world: Ibiza, NYC, and Miami – when I was actually flare free and healthy. I have never smoked, or drank alcohol. I also try to moderate trigger foods as much as possible. Get it checked ASAP. Unfortunately, as the years go on I am quite aware of the "C" risk increase. Having had a scare; I am very aware of the need for regular investigations. Try to be understanding and be there to the individual. Sometimes we feel so guilty that we're letting loved ones down, simple things like not be able to go out, or meet up. For me, it’s about not doing everything that my wife wants us to do. For example, we went to Brighton and I didn’t want to go on the i360, as I knew there were no toilets. This meant I got very anxious at the thought of going up, which brought on the urgency to go to the toilet. My wife and my daughter. This may sound odd, but on our first proper date (over 11 years ago) I told my wife (at the time a complete stranger, but soon to be girlfriend) everything about Ulcerative Colitis and what it means. Of course she hadn't heard of it, and was slightly anxious but she didn’t run a mile and has been 100% supportive. Now she's my wife and couldn’t be more caring, understanding, and supportive. My daughter is only just coming up to 2 years old, but she has so much drive and personality. She keeps me going through the tough times. She is our little miracle, knowing full well that some of the medication I have been on could have had a real impact on my fertility. "I may not have been dealt the perfect hand but I make the most of my life in the best way I can." During my school life there was little known about the condition and it was quite rare for a child to be affected by it. Even though the school was aware of my condition I still had to deal with teachers not really understanding what it meant. If I had the requirement to use the loo I had to the leave the class there and then. Not the done thing, really I should have put my hand up and ask my teachers permission. I could be on the toilet for up to 20 mins at a time with severe discomfort. On my return to class i'd hear “Where have you been Mark? !” in an angry voice, “In the toilet, Mr Morris” I'd have to say, standing in the front of the class. It felt humiliating. And that was the best scenario. I've lost count the number of times I was restricted from using the toilets at school, and not being able to get there fast enough. This resulted in deeply humiliating accidents in the middle of corridors. As I grew older, and went out more in town, I would never go more than 100m from a toilet. I also had a ritual of stuffing toilet paper in my underwear, and in my pockets in case of an accident. Since diagnosis, myself and my family have been members of the NACC – National Association for Crohn's and Colitis, (Now called Crohn's and Colitis UK) which promotes awareness for Inflammatory Bowel Diseases. 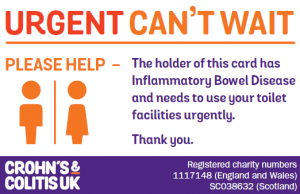 All members receive a plastic card which reads: “CAN’T WAIT!, Please help – our member has a medical condition which is not infectious and means they need to use toilet facilities urgently. Your kindness and cooperation would be much appreciated”. The card does not guarantee that you will be allowed to use these facilities, as companies are not willing to give such a commitment, but it may confirm that you have a genuine and urgent need. NACC encourages companies to allow access to toilets as part of a good 'customer care' policy and from time to time publicises the 'Can't Wait Card' scheme to make retailers and staff aware of the need. I can say that in shops that do not have customer toilets this card has allowed me to use their staff facilities, of course being escorted. A special gold star has to go to Boots (Kingston Upon Thames), as they made every effort to make me feel welcome when using their facilities. Those living with IBD are also eligible for a RADAR key, which gives them access to disabled toilets. I find I use this a lot as the state of some of our public toilets are disgusting. But I get so frustrated when some premises (mainly nightclubs and bars) change the lock to just a standard lock so the RADAR key doesn’t work. I remember one incident few years back when I was on a night out and needed to use the facilities, and the normal male toilet cubicles were blocked with sick. I quickly found the disabled toilet, but the lock had changed. A bouncer saw me trying to use the door and asked why. I explained my condition, and he was of the view because I wasn’t in a wheelchair I had no right to use the disabled toilet, and sent me back to the normal cubicles. Which left me no option but to empty my bowels in the blocked toilets. I felt sick after that, not surprisingly, and left the club. I think the point I'm trying to get across is, if we need to use toilets urgently we will make every effort to find an alternative before asking staff to use theirs. As the embarrassment of trying to explain our condition to them, or the risk of them not understanding, could result in no access to their toilets, with the possibility of having an accident. It's just not nice! Thank you Mark for sharing your story here on BecxBlogs. If you are affected by Crohn's or Colitis; please go to the Crohn's & Colitis UK website for further support and information. Voices of IBD (5) - Daisy's Story. How to choose the RIGHT Skincare! Voices of IBD (4) - Clare's Story. 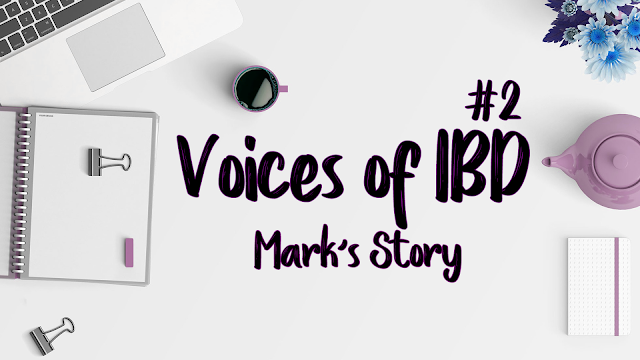 Voices of IBD (3) - Sarah's Story. Going back to college as an adult learner!